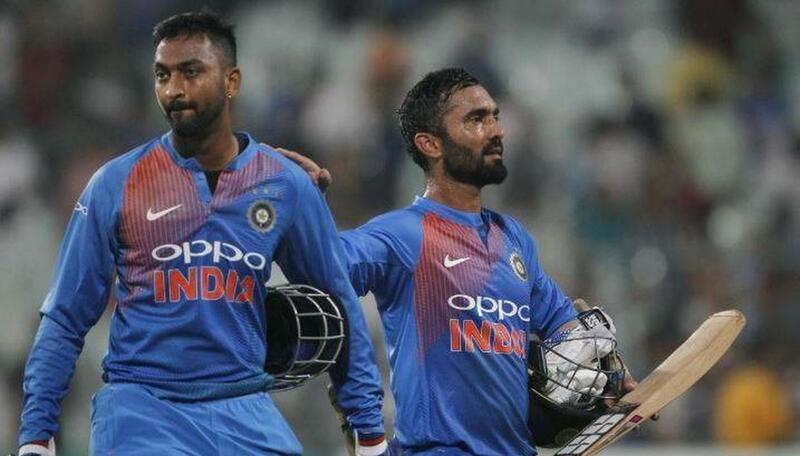 Swashbuckling middle-order batsman Dinesh Karthik, who has won a number of matches for India with his batting heroics, faced ire on Twitter following his bizarre decision in the third T20I between New Zealand and India on Sunday, which the hosts eventually won by 4 runs. Chasing 213, India needed 16 runs in the final over, with Karthik and Krunal Pandya at the crease. Karthik was on strike, and could only get two runs from the first two deliveries of Tim Southee. In the third ball, the 33-year-old failed to connect properly and the ball went to log on. Krunal set off for an easy single, but much to his surprise, and fans', Karthik refused to take a single and chose to keep strike. Not take a single meant that India needed 14 from the final 3 balls. And eventually, his decision proved to be a mistake as his team lost the match by 4 runs. Social media users were left aghast by this act of Karthik, and slammed the 33-year-old. This result meant that India's incredible recent run in the T20I format was halted with a 2-1 series defeat to New Zealand in the T20s. The Men in Blue, who came into this series on the back of a demolishing 4-1 victory in the ODI leg, feel just short against an inspiring Kiwis unit gunning for revenge. The hosts had won the first T20I comfortably, but India repaid the favor with a easy victory in the second T20I. The stage was set for the third T20I, and the match lived up to its billing. Kiwis, batting post, posted a formidable 212 for 4 in their 20 overs thanks to some aggressive batting by openers Colin Munro (72 of 40) and Tim Seifert (43 of 25), as well as Colin de Grandhomme (30 of 16). In reply, India were on course for yet another success at the mid-point of their innings. The Men in Blue were 108 for 2, with skipper Rohit Sharma looking in fine touch and Rishabh Pant playing magnificently. Despite being behind at the 3/4th mark in the match, the Kiwis bounced back sensationally to register a close 4-run victory.